2018 Motegi 2 piece suit by Alpinestars. Constructed with premium 1.3mm full-grain bovine leather for high levels of abrasion resistance, comfort and durability with multiple-stitched main seam construction for maximum tear resistance. Extended, reinforced stretch fiber stretch panels on arms, crotch and legs. Accordion leather inserts on lumbar area, knees and elbows for excellent fit and reduced stress on body while in riding position. Stretch fabric accordion inserts on rear shoulders. Removable, CE certified protectors on elbows, shoulders and knees feature injection molded protection and dual density foam padding for exceptional protection against impact forces. Integrated PE foam padding on the chest, hips, coccyx, upper arms and torso further enhance fit and comfort while riding. Chest pad and back compartments with PE padding (Alpinestars Ce certified Nucleon chest and back protection available as accessory upgrade). Snap connection system allows integration with Alpinestars CE level 2 certified Nucleon Race Back Protector for the ultimate in protection. Full circumference zipper to safely and securely attach jacket and pant together. Fixed mesh liner ensures a breathability and cooling comfort. Premium YKK fasteners used throughout the garment. Ventilated back hump is aerodynamically sculpted for superior air flow and performance at high speeds. Striking printed graphic detailing gives suit unique styling. 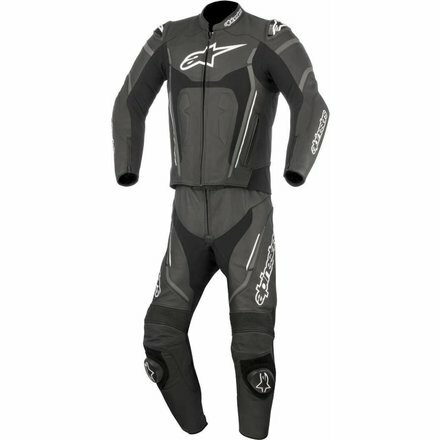 Reflective detailing or arms and legs improve visibility of rider in poor light conditions. Velcro and D-ring waist adjustment are positioned on the inside helps keep jacket close to the body and promotes an anatomical and personalized fit. External zippered pockets and interior waterproof wallet pocket for safe, peace-of-mind storage.